"Hi, I have recently bought a new iPhone and want to transfer only messages to it. Can anyone tell me how to transfer messages to new iPhone without losing or affecting any other data?" Well, this is a common problem that many iPhone users have met. This article is going to show you a way through which you can do text messages transfer to new iPhone without any hassle. Moreover, considering your concern, we would again like to tell you that your data will not be affected in any way with the method that we will introduce. So, let’s cut the long story short and learn the process. In order to do text messages transfer to new iPhone easily and effectively, all you need is iMyFone iTransor (renamed from D-Port Pro) which is counted as one of the best backup and restore program. 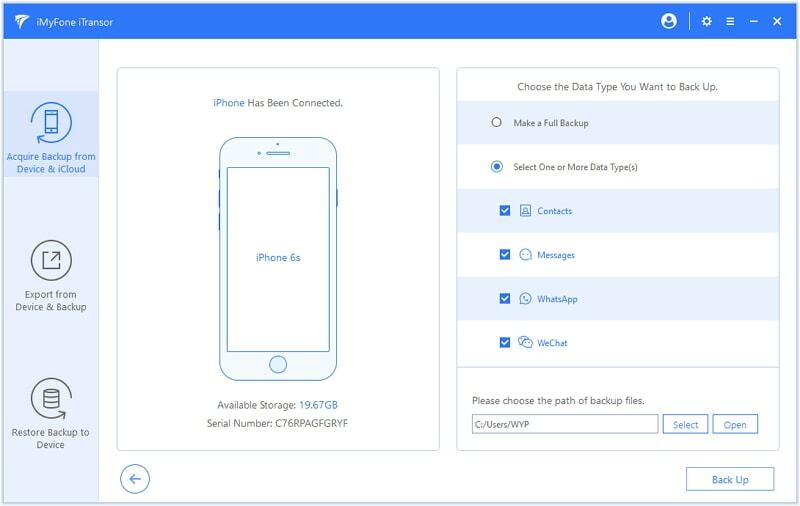 This program stands out because it helps the users selectively backup iPhone data and perform the process smoothly without any overwriting the previous backups. What's more, it is compatible with iOS 12/11 as well. iTransor is the most flexible tool which allows the users to choose to make a full or partial backup on their device. 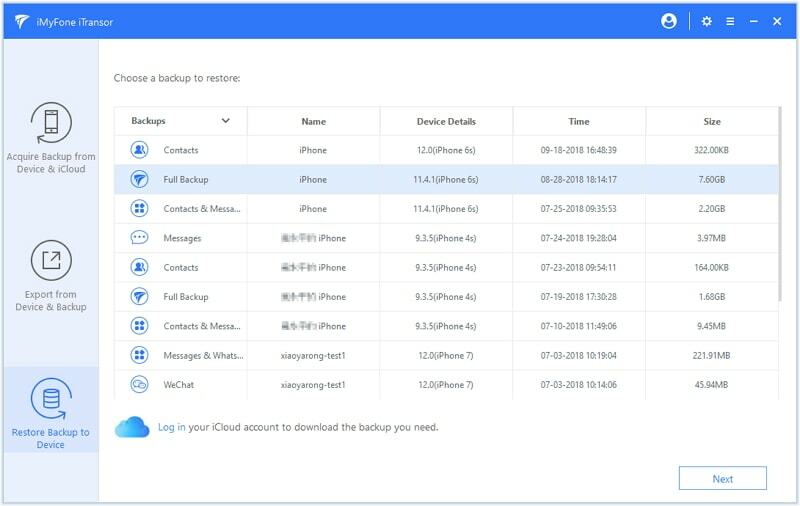 In other words, if the users want to backup only certain type of data like messages, contacts, WeChat or WhatsApp, they can easily do with this tool. Once you create a backup, you can view the data in that backup as well. No backup file will be overwritten using this tool. You can also restore the data selectively. 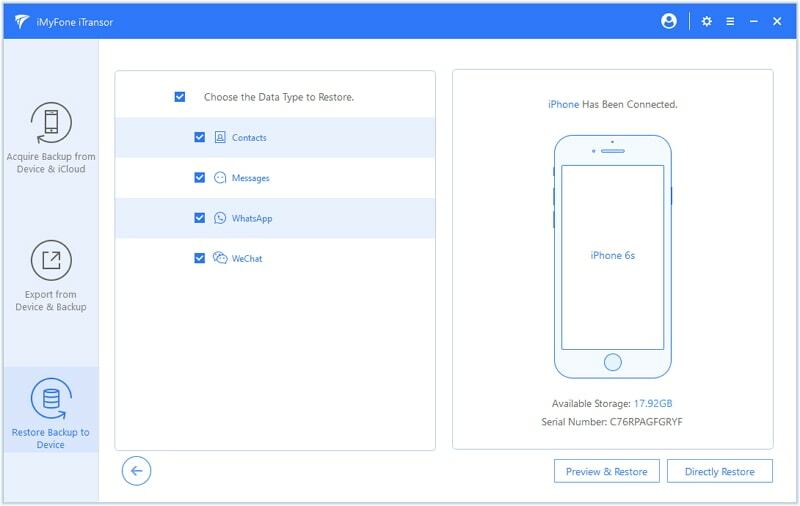 For example, you can smoothly restore only messages, contacts or WhatsApp messages, WeChat messages from the backup you made with iMyFone iTransor, iTunes, or iCloud. This tool helps in extracting 20+ types of data from iCloud, iTunes or iMyFone iTransor backup. The latest iOS 12 is also supported. If you have an iCloud or iTunes backup, you can do the text message transfer to new iPhone from iTunes or iCloud Backup with iMyFone iTransor, because iTunes or iCloud has a major drawback that they can only restore full backup to the device and do not allow you to selectively restore data to the device.With iMyFone iTransor, users not only can transfer only text messages from the whole backup to your iPhone but also can preview the data before restoring. 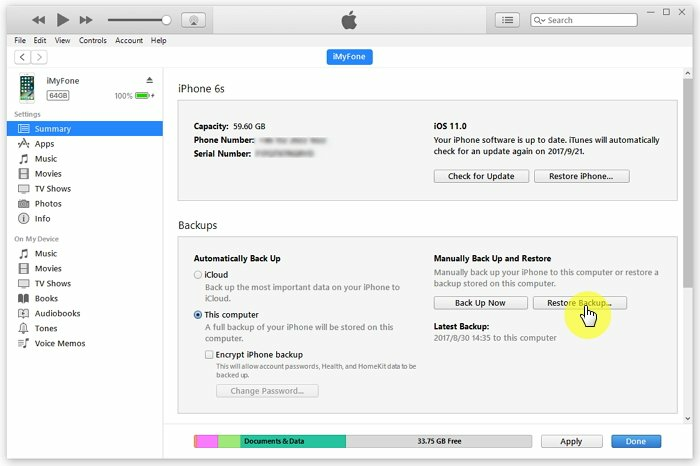 Step 1 – Launch the iMyFone software and get into the "Restore Backup to Device" tab in the left panel and select the iTunes or iCloud backup file from the backup file chart. Hit "Next" after selecting one. 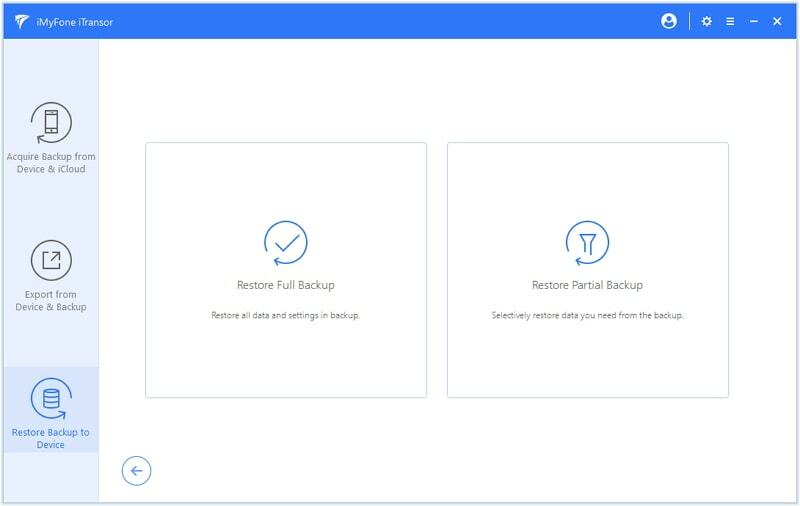 Step 2 – Now that you’ve selected an iTunes backup file from the list, you will be prompted to choose form "Restore Full Backup" or "Restore Partial Backup". Tap on the option "Restore Partial Backup". Step 3 – After that you need to choose the data type(s) that you want to restore. Here we choose Messages and then connect iPhone to computer via USB cable. Now select preview before restoring or restore directly. Step 4 – The program will show you two options for this restore - Merge and Replace. Before making the final decision, remember to read the notes carefully. Step 5 – Lastly, wait for a few minutes, all your messages will be restored to the iPhone easily. Using iMyFone iTransor is again very useful when it comes to backup iPhone as unlike iTunes and iCloud, it doesn’t overwrite the previous backed up data or any other file on your device upon restoring too. Here is the step guide to backup old iPhone and to transfer messages to new iPhone using iMyFone iTransor. Step 1 – Launch the software and connect the old iPhone from which you wish to backup your messages. 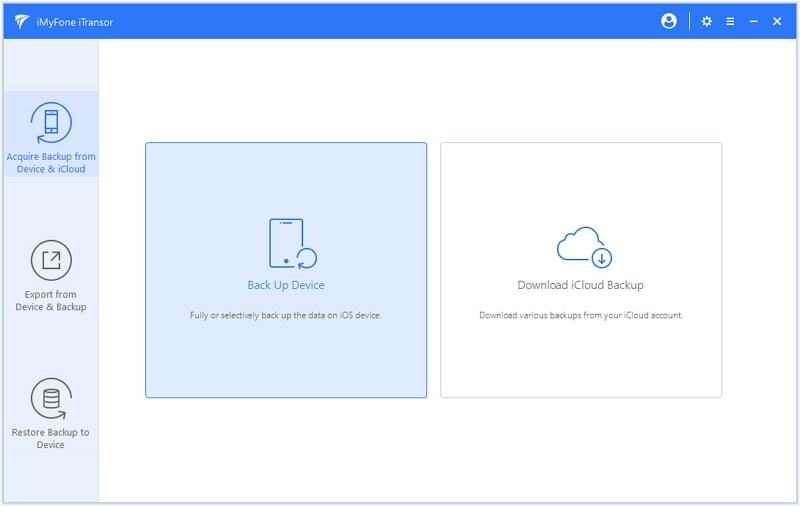 Get into the "Acquire Backup from Device & iCloud" tab. You will then need to click on the "Back Up Device" option. Step 2 – Next, plug your device into computer and tick the Message data type. Tap backup button to start backing up only messages on your old iPhone. 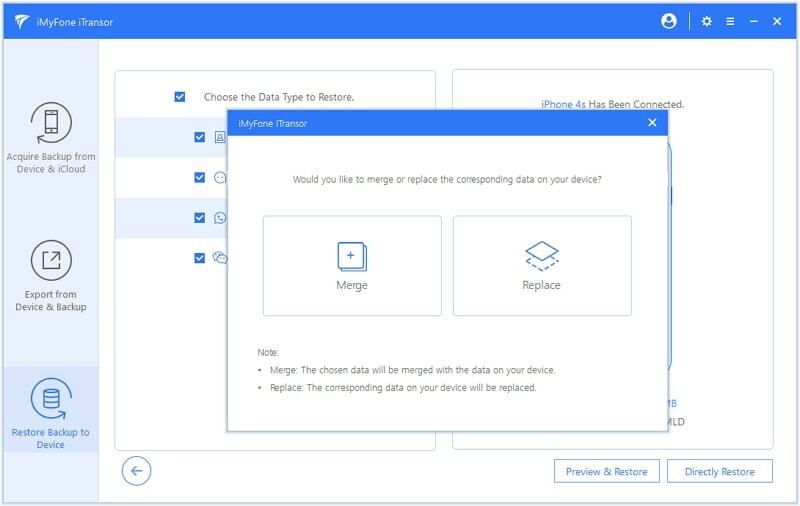 After process completes, disconnect the old iPhone and choose " Restore Backup to iOS Device" by the following instructions on how to transfer messages to new iPhone. Step 3 – Now, get into "Restore Backup to Device" tab and connect your new iPhone to computer via USB cable. Choose "Preview & Restore" or "Directly Restore" to proceed. Step 4 – On the next screen, there are some notifications you have to know before restoring. Tap "Merge" or "Replace" to proceed. Step 5 – The program will restore the backup file and after that you can view the old messages from your old iPhone on your new iPhone. Well, if you talk about restoring only text messages from the iTunes or iCloud backup file using iTunes or iCloud, that won’t be possible. It is because they do not offer such functionality to restore data selectively. 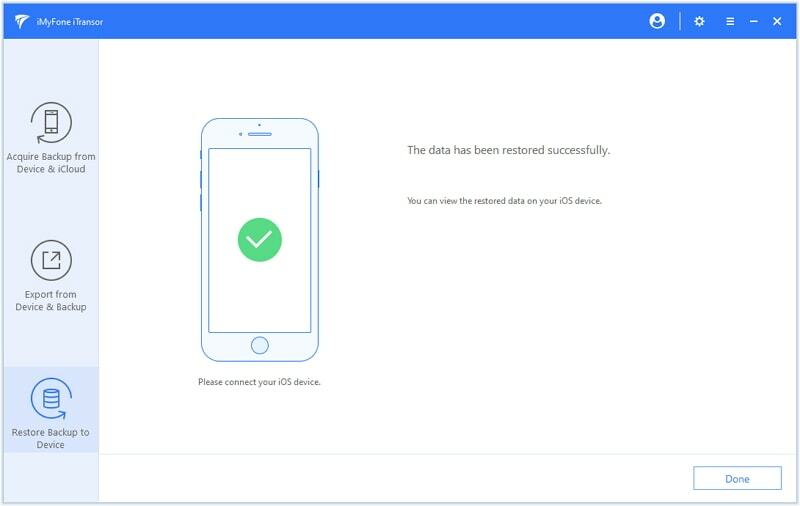 Users have to restore a full backup to the device which, in turn, overwrites the other data on iPhone and a large amount of unwanted data will occupy space on your new iPhone. Moreover, the restoration process is also time-consuming. Step 1 – Launch iTunes and connect your new iPhone to it. iTunes will automatically detect it and you are required to click on your iPhone then. Step 2 – Now tap on the "Restore Backup" option and choose the desired backup file from the options listed. Step 3 – Lastly, hit "Restore" and wait for the process to complete. Step 4 – Your device will then reboot automatically and sync with your computer on boot up. Wait for it to reboot and sync, after which you can use your device. Step 1- Go to "Settings" on your iPhone, then click "General" => "Reset" => "Erase All Content and Settings". 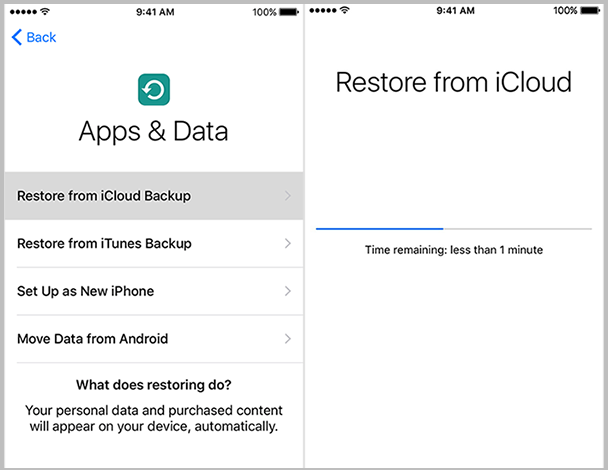 Step 2-When the iPhone restart, on the Apps & Data screen, click "Restore from iCloud Backup". Then follow the instruction to choose a iCloud backup to restore. Please kindly note that the other data on your device will be completely overwriten if you choose these 2 methods, so remember to backup your device before restoring. In addition, restoring iPhone from iCloud backup will require good network connection, or errors could occur during the process. Restoring iPhone from iTunes backup requires the latest version of iTunes, or restore errors will occur as well. Well! We are closing the topic with the expectation that you now well understand the tutorial for how to transfer text messages to new iPhone. Let us know your experience if you have made backup with the tool mentioned above. Many thanks for reading!